So, my next book Salty Snacks is going to be released last week of September…. After all those months creating and testing recipes, doing research, talking with countless folks about the world of salty snacks and some of their favorite preparations — editing, tweaking, pacing in consternation, editing some more. This waiting now is almost the hardest part! To tide me over, I’ve at least got one single advance copy of the book in my hot hands, which makes it all seem one big step closer. Then came the surprise of the book’s first review! Never would have expected one so early, but there it was, from Publisher’s Weekly. Really very happy with it, complaints limited to the idea that “novice entertainers hoping for basic guacamole or cheese straw recipes will likely be overwhelmed by Nims’ inventive assortment.” I guess I kinda take that as a compliment. A book full of predictable, everyday recipes would have been far less fun to write. And wouldn’t have been nearly as fun for readers either. It’s funny to me that they picked guacamole of all things. I love guacamole in a big way. Actually, avocados in all forms. But one of the very best forms for avocados to take, in my mind, is moderately mashed, embellished with tasty stuff, stirred up and enjoyed with gusto. Guess it’s a dish for which I’ve got a bit of a recipe blind spot. I don’t think I’ve ever looked up a recipe for guacamole, though surely have glanced at a few in passing in various books or magazines over the years. And I likely haven’t made it exactly the same way twice. I’m not wedded to 2 tablespoons of lime juice and 1/4 cup of cilantro or anything like that. Back in college days I spent about a month living with my big sister between when my university’s summer break began and when my summertime accommodations would be available (that was the summer I lived in a fraternity on the UW campus, a summer for the books! a story for another time…). Maybe it wasn’t every evening but it seems like it — we’d make a big huge bowl of guacamole, open a bag of corn chips and call that dinner, catching up on our days and chatting about life. 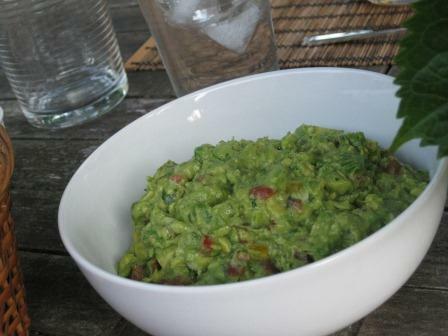 Sometimes a batch of guacamole at my house is as simple as a mashed up avocado into which I stir a few generous spoonfuls of purchased pico de gallo style salsa. 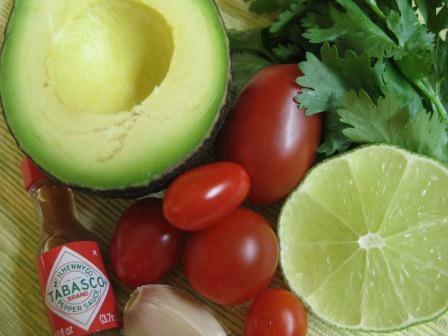 It’s got the onion, tomato, cilantro, some seasoning, enough acidity to brighten the avocado and help avoid discoloration. Nothing fancy, but it does in a pinch! The best guacamole I can recall having was at Oyamel in Washington, D.C. This José Andrés restaurant was a favorite from trips while our nephew was in college in DC — we got to have this table-side preparation of guacamole a couple times. His take includes tomatillos, serrano chiles and queso fresco. Definitely worth the premium price in my book. So that lovely book review got me ruminating on guacamole for a while, and there’s little surprise that I was soon whipping up another bowl of the rich, bright, flavorful dip. Of course, good avocados come first. Been bummed on more than a few occasions when I get a hankering for guacamole, only to find firm uninspiring avocados at the store. It’s definitely a treat worth waiting for, life’s too short for flavorless, too-hard avocados. If I have even a smidge of patience that day, I’ll buy a couple and set them aside to allow time to ripen. On a trip to Santa Barbara a couple years ago, I made a Saturday morning trek to the farmers market (always on my agenda when visiting new cities). The market selections proved I was definitely not in Seattle any more, with the piles and piles of artichokes, varieties of citrus. But what had me stopped in my tracks and momentarily considering a move was the tables mounded with avocados. 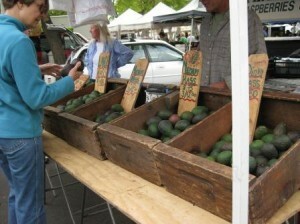 One vendor arranged them by “today” “tomorrow” and “2-day” ripeness. Super green with jealous, I was. So here’s how last weekend’s guacamole went. 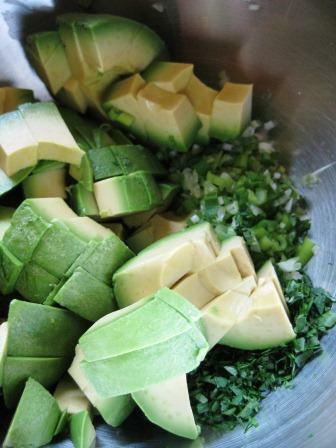 I chopped up the peeled and pitted avocados (two for four of us) and put them in a bowl with a handful of chopped cilantro, some thinly sliced green onion, a clove of Microplaned garlic. My favorite tool for mixing is a whisk that has fewer and broader/sturdier wires. I don’t like my guacamole to be too smooth. I mashed these few ingredients together until nearly perfect, some of the avocado creamy-smooth but with plenty of chunks still for contrast. Then I set aside the whisk and used a spoon going forward to maintain texture. I added a generous amount of finely chopped tomato (multi-color heirloom cherry/plum tomatoes for extra panache this time), some Tabasco, a good pinch of sel gris, some finely ground black pepper. Juice of about 1/2 lime. Stir, taste, amend seasoning. Try not to eat half the bowl right then and there. That’s it. My approach to guacamole. Never written it down before, but this would have been the starting point for a recipe in Salty Snacks if I’d included it there. Embellish/amend to suit your own whims and tastes. Enjoy with abandon.